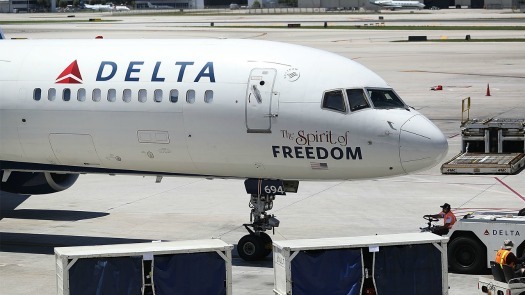 An emotional support dog bit a passenger on a Delta flight originating from Atlanta’s Hartsfield-Jackson International airport bound for San Diego. The event occurred on Saturday aboard a 737-900 aircraft before push back; the dog attacked a passenger in the next seat resulting in the passenger having been treated for his injuries. According to FoxNewsAtlanta, the dog, thought to be a Labrador retriever mix weighing about 50 pounds, had been sitting on his owner’s lap in the middle seat; the victim had been sitting by the window. A witness stated the dog owner was very upset and inconsolable. The flight crew described the dog’s owner as a “combat veteran” and as he hugged his dog in his arms at the gate area, the crew said he cried repeatedly stating, “I know they’re going to put him down.” Local law enforcement cleared the dog and its owner to continue their flight. The dog was ordered to fly in a kennel. The condition of the bite victim nor the extent of his injuries are known at this time. 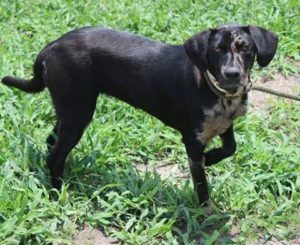 Read about Schatze who is scheduled to die on Monday. 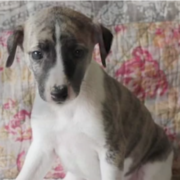 Share her story and help her find a loving home. So why did the dog bite the other passenger in the first place? These dogs are well trained, and NO dog bites without a reason! Something caused this, and I’m willing to bet it wasn’t anything the dog did. Wrong. There is no training requirement for an “emotional support animal”. Anyone can pay for an online doctor to issue an “emotional support animal” certificate for their dog, sight unseen with no behavioral evaluation whatsoever. Perhaps you are confusing it with a real “service animal” as defined by the ADA. I believe that there is way more going on, Labs are docile and feel the passenger had to have done something perceived as a threat and the dog protected the veteran, unlike people they are not conditional, please do not put this wonderful animal down, it seems the passenger is okay and there is no need to disrupt the situation more, have mercy! Not all labs are docile. Just as not all the so called aggressive breeds are aggressive. I’ve seen my fair share of mean labs. Put the dog down. The dog should have been on the floor. The passenger will require a lot of medical treatment. Why were no charges brought against the dog owner? Why did the flight attendant not remind the dog owner to put the dog on the floor? I am so sick of dog lovers that care more for dogs than people. I’m traveling soon and it won’t be on Delta. The dog owner should be charged, and the injured man should sue Delta. A service dog is well trained, my daughter has an emotional support dog, and all she needed was a note from her doctor saying he provided her support for her anxiety. He has had no training. Not sure about this dog, but dogs are pretty good judges of character, there is more to this than we are being told. Do we have any idea why the dog decided to bite the passenger? I am totally surprised that a 50lb dog was allowed to ride on the lap of a person in the middle seat of one of these planes to begin with. There is hardly enough room for a person in these seats let alone a dog. An “emotional support” dog really isn’t anything more than a pet with a certificate from a doctor saying he provides emotional support for the owner, maybe a muzzle next time? I do hope the dog doesn’t lose his life over this! You can actually call any dog that helps you with anxiety an “emotional support” dog. My daughter suffers from anxiety attacks and her little dog helps relieve them so she was able to get a note from her doctor that allowed her to rent an apartment and keep him. Toby has no formal training. I don’t know what happened here, but I don’t think a 50lb dog should be sitting on someone’s lap in the middle seat on one of these airplanes where the room in the seat is hardly big enough for the passenger. I truly hope nothing happens to the dog, but from what I have read since, he did quite a bit of damage to the other passenger. I hope nothing happens to this dog. I’m curious as to what caused the dog to bite a fellow passenger. I love my dog just like a child, but dogs belong in cages when they are flying regardless if the are a “comfort” dog. If guy needs that much comfort, then buy a seat for the dog and have it properly harnessed and restrained in case of it having emotional problems. In any case, if the dog bit me, I’d check to see if it is properly licensed as a comfort dog and still talk to an attorney to find my right to all the compensation for being bitten by an unrestrained dog. I was on the flight two rows ahead of the dog. That dog was not a lab mix – it looked like a pit mix to be honest. No one provoked the dog. I think the dog was feeling the nervous energy of his owner (who had ptsd and didn’t like crowds) and the men seated next to him who weee nervous about the size of the dog. It was a horrible experience for everyone involved. The dog is not to blame, he should not have been put in that situation. He was on his owners lap in very tight quarters in a tense situation. Whether he should or should not be a service dog I do not know but I feel horrible for everyone involved. It was extremely scary and Delta needs to review its policies for service animal travel. Thank you for being honest about it being a pit bull or part pit. That is no surprise. They make up less than 10% of the dog population in the U.S. yet they are responsible for over 70% of human deaths by canine. Our government and the airlines need to get on top of this situation now. The deaths and maulings keep adding up. I agree with you, the dog shouldn’t have been put in this position, they are very good at picking up on stress and probably reacted. You are correct in observing the dog’s reaction to the veteran’s anxiety and the Veterans lack of response to the dog. Because of this lack of response and the proximity of the seated passenger and the sense of fear, the dog, no matter what the breed, acted out of protection to the owner. Thank you for your truthful insight into this unfortunate situation and especially for not blaming the dog – those seats on planes are so tight and since the owner was antsy I am sure the dog sensed this – Delta should have seated the owner and dog away from other passengers – no matter what breed it was, the whole situation could have been handled much better. There are 15,000 dog attacks a day in America alone, over 3 million a year. And those are only the attacks that required medical attention and therefore got reported. On average, two people a month in this country are killed by dogs, 18 people a year, usually small children and elderly. Responsible dog ownership and dog safety education is severely needed in our country. I, myself, am allergic to dogs. Why does a dog have the right to affect my health in supposedly protecting another’s health? Whose rights should prevail? I have to tell you, I am getting sick and tired of dog lovers who put dogs above human beings. Go take a look at all the little children who have died from attacks by dogs, and then tell me how blaming dogs isn’t the right response. I couldn’t care less about your dog. Keep it away from me and make sure I am not disturbed by incessant barking. If you insist on loving a dog, you have the responsibility to ensure that that dog is constantly under supervision and not disturbing others in any way. The passenger did nothing to deserve being bitten, who are all of you to assume he “must have done something?” It’s an animal, and animals can sometimes be unpredictable, and it wasn’t supposed to be in his lap. It is an esa, NOT a specially and rigorously trained disability service dog. How much you wanna bet the “lab mix” is half pit? I do feel terrible for this combat vet, but he can’t take a dog that aggressive into enclosed spaces and it is not a good therapy dog. To use it further is to put more people at risk. My niece’s dog is an “emotional support dog”. Her doctor signed off on her being able to have it in her apartment at college which did not allow pets. She got it right after her father (my brother-in-law) died. He was not required to have any special training like a service dog. This said…there is no true regulation for emotional support dogs…yet they are allowed on planes, in restaurants, etc. I can see that this could be a problem. As the owner of three German shepherds, who are wonderful dogs (but not service dogs), I would not be able to guarantee that they wouldn’t bite someone given the circumstances of this situation…being on a cramped plane, etc. I do not fault the passenger who got bit in the slightest! I am sure he did nothing to ‘provoke’ the dog…who would want to? And run the risk of getting bit. Just to make a slight correction to your statement- ESA’s are ONLY allowed to travel with passengers on planes and provide comfort in the owners home. They are not allowed in restaurants or other public spaces, this right is reserved for service animals alone. If someone is trying to take their ESA into a restaurant and have it pass as a service animal, it is illegal and punishable in court. I completely agree with you otherwise, but just want to make sure nobody thinks these dogs are allowed in all public spaces.